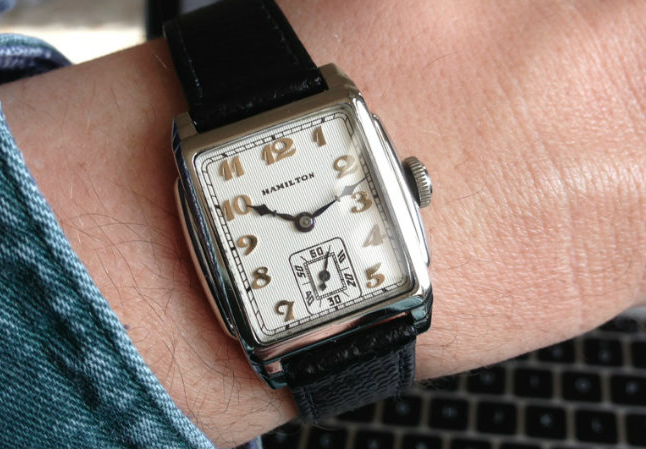 The Hamilton Dixon was introduced in 1935 and produced for four years. 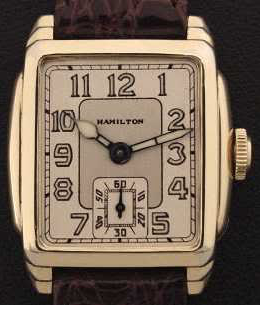 Like many Hamilton watches from the 1930's, it exhibits classic Art Deco design features... mainly visible in the geometric shaped stepped lugs and printed dial patterns. For the first two years of production the Dixon was available with either a white or a yellow gold filled case. However, only yellow gold filled cases were available in 1937 and 1938. As far as dial patterns go, the Dixon was available with either an AGN version, black enamel or luminous pattern. So there are lots of possible combinations to obtain but I think the AGN version in a yellow gold filled case is the most common. I don't recall ever personally seeing a luminous version. The case tends to show a lot of wear through to the stepped lugs. In fact, it's quite rare to find a Dixon without at least a little bit of wear to the bezel near the corners of the crystal. The case back can also show wear through along the edges. Since the Dixon spans the period from 1935 to 1938, you're more likely to see a 6/0 sized 17 jewel 987-E under the hood but it wouldn't be surprising to find a 987A either. Here's a wrist shot of a yellow gold filled Dixon with the applied gold numeral dial in my collection. If you look closely, you can see the ridges in the textured dial. And here's a wrist shot of the white gold filled Dixon with AGN dial. 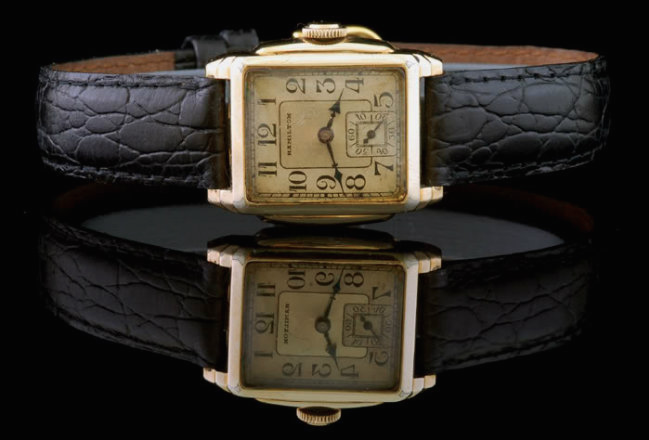 Note the hands are black and the numerals are yellow gold, despite the cases white color. 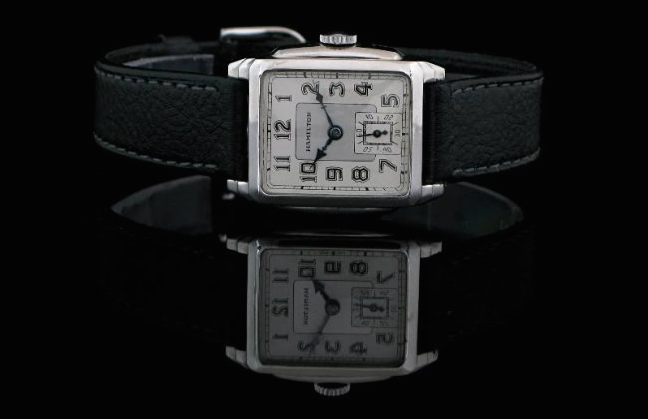 In the 1940's Hamilton would rhodium plate the gold numerals so they would be white in color - but not these earlier watches. Just the hands would be black with a white case. Here's a couple of really nice studio shots of Dixons with enamel dials... one in a yellow case and one in a white case. Photos courtesy of Tom Diss. If you look closely you'll note that there are actually two different black figured dial patterns. Thank you for this information. 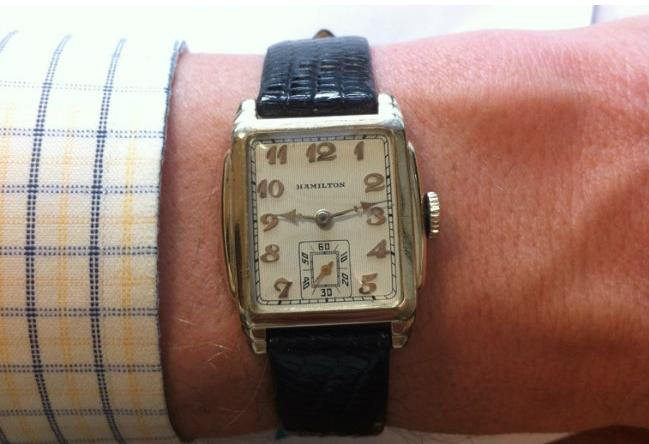 I have a Hamilton wrist watch that is absolutely identical to the first wrist shot photo. It was originally my fathers, so I guess he spent $40 for it when he was 19-20 years old in '37-'38. Or possibly a high school graduation present in '36? I just had it overhauled by a local watchmaker. It needed a new set lever & mainspring, both of which he located original Hamilton parts for. It had been inoperative and in a desk drawer for 45 years or more.